+ the news just announced that january here in new mexico has been the warmest in 111 years. 64 for tomorrow. and folks back east are getting frozen out. what we wouldn't give for a little precip. + silicon valley: .net to become dot-not. sun comments, as well. thanks, ray. + ft: u.s. warns north korea after nuclear bomb alert. + edie: when it comes to reducing pollutants, less is not necessarily better. sometimes. + businessweek: new global job shift. "... manila, shanghai, budapest, or san josé, costa rica. these cities - and dozens more across the developing world - have become the new back offices for corporate america ..."
+ middle east times: iraq uncertainty drips poison into u.s. economy. "the cnn effect" ... heh. + nj.com: sharpton, to ever be seriously considered, needs to resolve the brawley incident. + cnet: amd delays athlon 64 chips. + webdevtips: how to achieve validation with colored scroll bars. + telegraph.uk: a five minute laser blast clears acne. + msnbc: u.s. to join research effort for fusion power. + ny daily news: nypd jogger theory ripped. + usc annenberg online journalism review: guarding against libel lawsuits. + freshmeat: pysite sounds useful. + fox news: blix's report to the security council, full text. read and judge for yourself. + washington file: afghanistan sounds like an environmental disaster area. + telegraph.uk: britons lack a german love of culture. + times of india: germans sentenced for shipping arms to iraq. "the defendant is a one-man company who got around rather strict german export controls. we want to control what arms deals are being done in germany's name." in all news media, i'm finding an uptick in the number of german and french news items, both good and bad. a lot of cheap shots, too. + csm: even reality tv producers turn some ideas down. this lowest form of hollywood life has yet to learn the 'trevanian' lesson. + la times: when image isn't enough. discussing the exxon/mobil pullout from pbs. + ny times letters to the editor: invoking the bible in the war debate. it all boils down to who is doing the interpreting. + ny times op-ed: apparently, there are mitigating factors in the infamous story of the gassing of iraqi kurds. i have pointed out previously that one of our allies (turkey) has also used biological and chemical weapons on the kurds. specifically. + ny times editorial: why today's europeans object to america's worldview. "of course, europeans live in a paradise of modern convenience and cultural tradition at least in part because they have handed over responsibility for military engagement to the americans." interesting article. 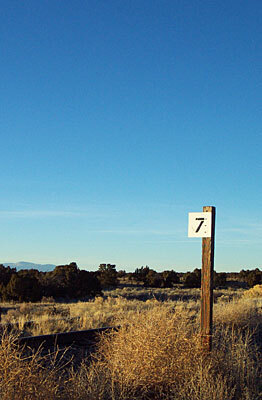 + ny times: 36 hours in taos, new mexico. hmmm. they didn't mention the bavarian lodge up at the taos ski basin, where you can hear *excellent* canned bavarian music ... honest, you can ask andrea, andré and hal. + ny times: study concludes snowmobile ban best for parks. + ny times: a once-doomed nomination wins senate panel approval. the beginning of the bitter pills we democrats must swallow. + santa fe new mexican: today's los alamos linkage ... federal report blasts lanl, and state says los alamos runoff has highest plutonium levels. if you ever wonder why i get 'uppity' about environmental issues, this is one reason. note, *no* mention of prevention or cleanup. + washington post: democratic rivals' war dilemma. the anti-war hawks?